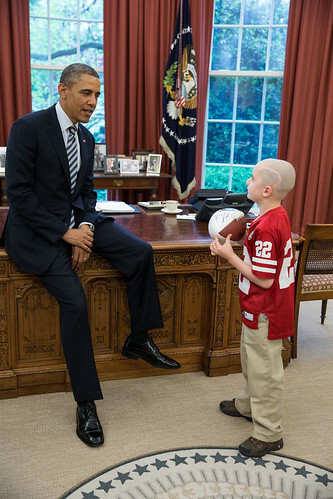 Original caption: "President Barack Obama greets Jack Hoffman, 7, of Atkinson, Neb., in the Oval Office, April 29, 2013. Hoffman, who is battling pediatric brain cancer, gained national attention after he ran for a 69-yard touchdown during a Nebraska Cornhuskers spring football game. Hoffman holds a football that the President signed for him." Todays' Kitsch Cover is Karmin performing Chris Brown's (yeah, sorry, but this is too ridiculous) "Look at Me Now". On the Ellen show. So, that's a thing. Well, uhh, I don't know if Joe Biden is eligible for NCAA football, but we will certainly look into it.